100 years ago, on 17 July 1917, the British royal family changed its name by proclamation from the House of Saxe-Coburg and Gotha to the House of Windsor, naming themselves not after the meaty soup, as many suppose, but the town of Windsor, perhaps even its nice castle. Queen Victoria imported the Saxe-Coburg and Gotha house into the royal line when she married, in 1840, the German dukeling Prinz Franz Albert August Karl Emanuel von Sachsen-Coburg-Saalfeld, Duke of Sachsen. She already had plenty of German in her from George III, her grandfather. Albert was her first cousin and thus the pairing was the triumph of dynastic matchmaking over genetic caution. 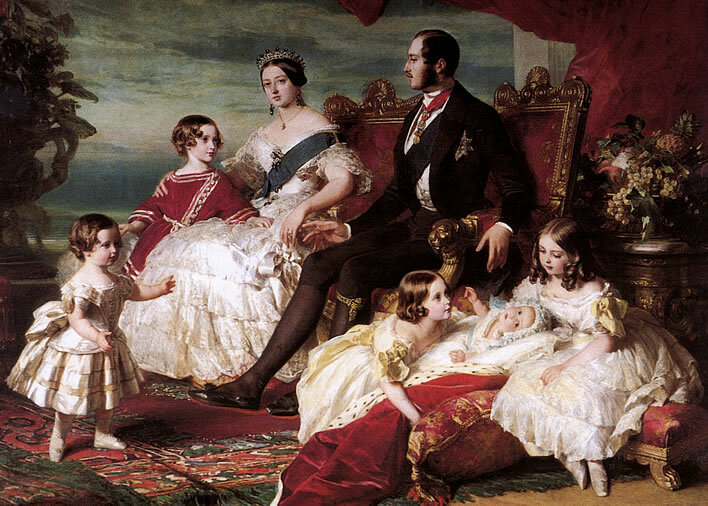 Franz Xaver Winterhalter (1805–1873), Queen Victoria, Prince Albert and their children (1846). That French bounder Bonaparte had been put down in 1815. For most of the rest of the 19th century the French were always in some degree of disfavour with the British. Britain saw Germany as its natural partner in Europe and it is thus no surprise that the members of their royal and feudal families clung to their common roots. Happy days and royal sleepovers. As is usual at these events, the cousins just can't resist trying on each other's clothes. Far left: Kaiser Wilhelm II dressed in a Russian uniform. Next to him cousin Tsar Nicholas II in a Prussian uniform. Photo taken 1905. Far right is King George V, dressed up as a Russian. On his right	Tsar Nicholas, about to crumple under the weight of his English bling. Photo taken c. 22 August 1913, about one year before the start of the Great War. Such blatant uniform-swapping tells us a lot about the weakness of national identity compared with dynastic identity within these crowned heads. 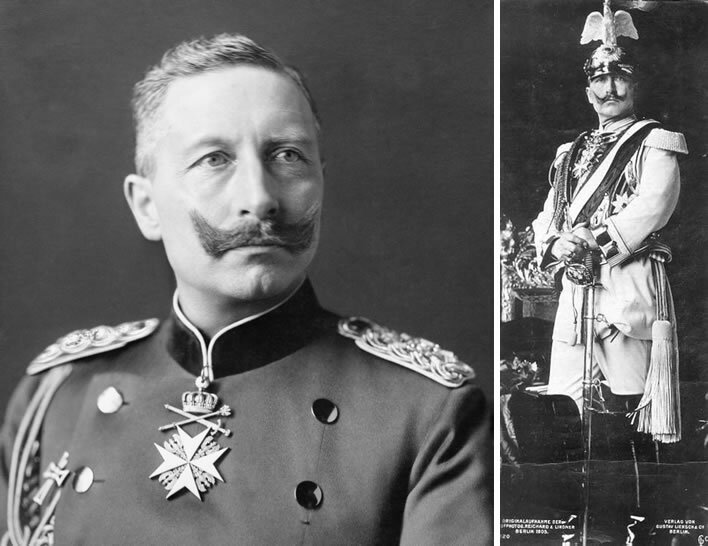 However, towards the end of the 19th century Germany came under the control of that borderline psychotic, Emperor Wilhelm II, a grandson of Albert and Victoria. Within a few years Wilhelm managed to change the warmth of the relationship between Germany and Britain into mutual dislike. During the ten years before the outbreak of war in 1914 the feeling of dislike was pumped up into bellicose hatred on both sides. Wilhelm's cousin, George V, was on the British throne at the time. George's queen was Mary, a woman of half-German descent who was a granddaughter of George III. When it comes to dynastic inbreeding, it is indeed a small world. One look is sufficient to know what we are dealing with. Top left: Head and shoulders portrait of Kaiser Wilhelm II by Court Photographer T. H. Voigt of Frankfurt, 1902. Image: ©IWM (HU 68367). Top right: Kaiser Wilhelm II in the uniform of the Imperial Household Guard with parade helmet, on a picture postcard 1905. Image: LEMO. Below: Max Koner (1854–1900), Kaiser Wilhelm II, 1890. Painting now lost. The War brought no good news. 'Biffing the Kaiser on the nose' turned into the horrors of trench warfare epitomised in those iconic names, Ypres, the Somme, Passchendaele on the Western Front, the landings at Gallipoli and the losses of naval attrition at sea. No town or village in Britain was spared. By 1917 the fun had gone completely out of the venture, for all the participants. And there was the royal family, most of them British by birth but having German descent to the core. The final straw came in the spring of 1917, when the newly developed large German bombers, the Gotha IVs, started dropping bombs on London, a foretaste of what was to come twenty-odd years later. The planes were manufactured by the Gothaer Waggonfabrik, hence they bore the name of the British royal family and the 'Gotha bomber' would become a household word at the time. Enough was enough. By royal proclamation on 17 July 1917 George V changed the name of the British royal family from the anglicised German 'Saxe-Coburg and Gotha' to the pleasantly English 'Windsor', a name with the added advantage that it is almost impossible for the non-native speaker, in particular the German, to pronounce. The other members of the House were compensated with British peerages; Prince Louis of Battenberg became Louis Mountbatten, a marquis, and trinkets were handed around the minors. As the war writhed to its end, a wave of monarchical cleansing washed over Europe. 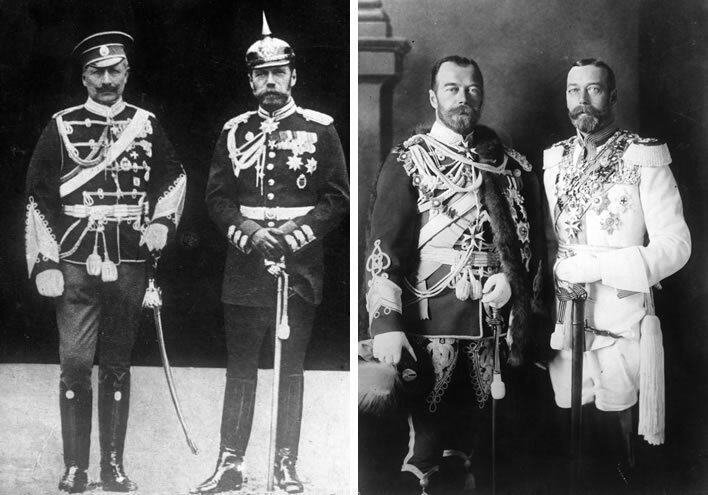 Lenin and Trotsky started the inundation with George's Russian cousin, Tsar Nicholas II. The Tsar was deposed on 15 March 1917 and executed with his family on 17 July 1918. At the end of the Great War in November 1918 George's German cousin, Wilhelm II, abdicated and fled to the Netherlands. 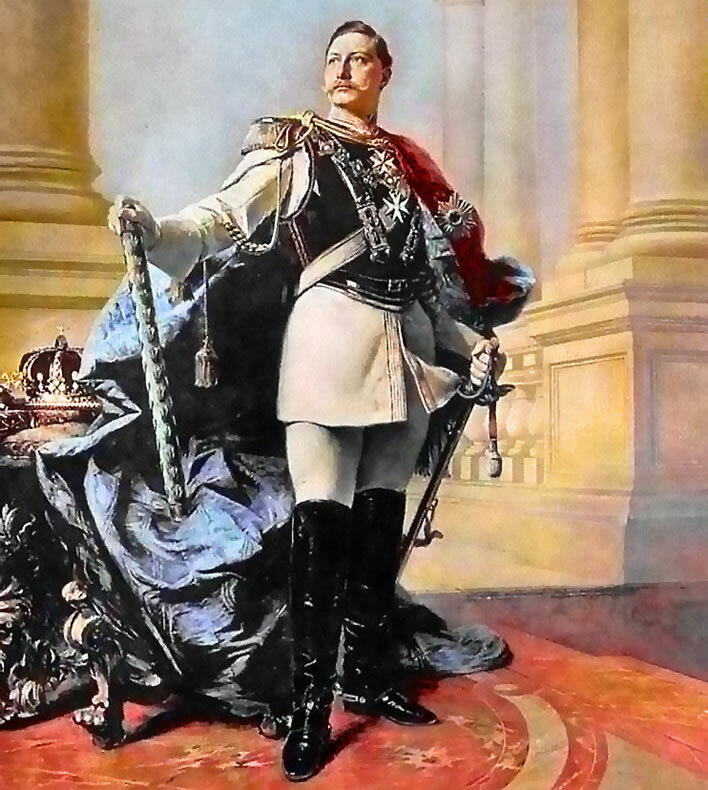 The last ruler of the Austro-Hungarian Empire, Karl I, also stood down that November – Austria became a republic, banning for good measure the use of all aristocratic titles. The Windsors are still with us. For how long, though? No one wants the job, we are told.